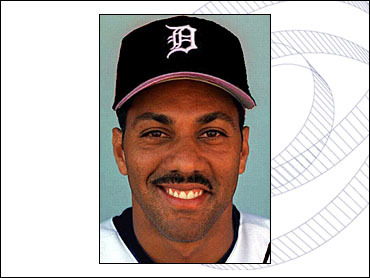 Juan Gonzalez agreed to a $10 million, one-year contract with the Cleveland Indians on Tuesday, giving the club a right fielder and power hitter to replace Manny Ramirez. Gonzalez, who has had a history of back problems, passed a team physical before signing the deal, which includes a $14 million mutual option for 2002. The Indians held an afternoon news conference at Jacobs Field to introduce Gonzalez as their new right fielder and cleanup hitter. "The driving force was our desire and need for a player of Juan's ability and Juan's desire to want to play in Cleveland," Indians general manager John Hart said. "We have a player that at 31-years-old has Hall of Fame credentials." Gonzalez, a two-time American League MVP, will help the Indians replace Ramirez, who signed with Boston last month. Gonzalez was diagnosed with a herniated disc following last season, his first with the Detroit Tigers. More troubling for the Tigers was that Gonzalez twice skipped medical exams, leading to speculation his back trouble was more serious. Gonzalez reportedly passed a physical with the Tigers, but the Indians wanted to take a look themselves. Last week, Gonzalez told a newspaper in his native Puerto Rico that he wants to play in Cleveland because he loves hitting at Jacobs Field and because he's close friends with Indians All-Star second baseman Roberto Alomar and outfielder Wil Cordero. Gonzalez has destroyed Indians' pitching as a visitor to the Jake. His 12 homers and 36 RBIs are the most by an opposing player at the hitter-friendly ballpark, and he has hit .344 (45-for-131) in 30 games at Cleveland. "It's a great ballpark for the hitters," Gonzalez said Monday night. "It's a small field with the wind blowing out a lot, and when you hit it hard, you have a great chance of hitting it out of the yard." In the past five years, Gonzalez has 627 RBIs to Ramirez's 632. Since the 1991 season, only three players Albert Belle, Frank Thomas and Ken Griffey Jr. have driven in more runs than Gonzalez. He would fit perfectly into the Indians' cleanup spot vacated by Ramirez, behind Kenny Lofton, Omar Vizquel and Alomar. Signing Gonzalez to a one-year deal is nearly risk free fo the Indians and give Cleveland fans something to feel good about. Indians fans have been grumbling ever since the club lost its bidding war with Boston for Ramirez and the departure of popular catcher Sandy Alomar, who signed with the Chicago White Sox. With a one-year deal, Gonzalez would be motivated to have a big season so he could cash in as a free agent next winter. Gonzalez last year rejected an eight-year extension from the Tigers worth about $143 million. Distracted by persistent trade rumors and bothered by nagging injuries, he batted .289 with 22 homers and 67 RBIs a career low and less than half of his average for the previous four years. Gonzalez never got comfortable in Detroit's new home, Comerica Park, batting just .267 there, with eight homers and 31 RBIs. On the road, he hit .307 with 14 homers and 36 RBIs. Another concern the Indians might have about Gonzalez is that he can be moody and high maintenance. He was frequently accompanied by a personal trainer and spiritual adviser while with the Tigers. Gonzalez would be the second significant signing by the Indians this winter. In November, the club signed outfielder Ellis Burks to a $20 million, three-year deal as insurance in case Ramirez left. He would get a $500,000 bonus if he is elected AL MVP, $300,000 for finishing second in the voting, $150,000 for finishing third and $100,000 for fourth or fifth. Gonzalez, who receives a no-trade clause, would get $75,000 if he is elected to start in the All-Star game and $50,000 if he is selected as a reserve. He would get $100,000 for winning a Gold Glove, $100,000 for a Silver Slugger, $50,000 for winning comeback player of the year and $25,000 if he is picked for a postseason All-Star team by The Associated Press, The Sporting News or USA Today. In addition, he would get $100,000 if he is MVP of the AL championship series and $150,000 if he is MVP of the World Series.